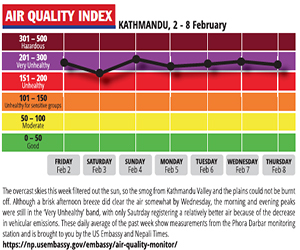 By most international standards Kathmandu should be considered uninhabitable because the city of 2.5 million has few functioning water mains. But one of the reasons the city hasn’t been abandoned is that its 400-year-old Malla-era water mains are still functioning. Kathmandu residents have learnt to improvise: they pump ground water, buy water from tankers or increasingly, collect rainwater. But the mainstay of water supply for inner city Kathmandu, Patan and Bhaktapur are still the heritage taps built by the Malla kings. Even though many of these historic water taps have gone dry because of the destruction of feeder channels, they are still the mainstay for water supply in most inner city neighbourhoods. As the dry season begins, it is a common sight to see long lines of jars waiting to be filled from the trickle that still comes out of these ingenious systems. Of the nearly 60 neighbourhood water spouts in Patan, many have gone dry due to encroachment of ponds that used to recharge the aquifers, or the foundations of new houses destroying the network of underground canals that brought water to the spouts. “Source degradation is the main problem in restoring the ancient water systems in Patan,” said Rohit Ranjitkar of the Kathmandu Valley Preservation Trust. 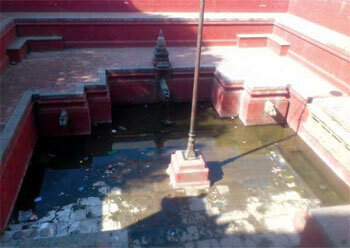 Locals say the restored stone spouts still suffer water-logging and garbage problems. There is also an effort to revive the 11.2 km royal water main constructed by Malla kings 300 years ago from Tika Bhairab to Patan Darbar. The 1.5m wide canal used to provide irrigation water along the way, and fed a network of underground aqueducts that fed water spouts. 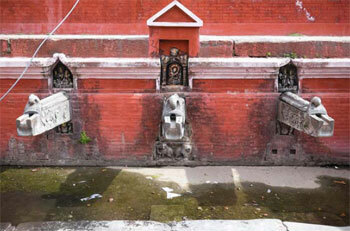 The recent restoration of the Nagahiti water spout at Nagbahal in Patan (pic, right) is proof that with determination and teamwork it is possible to bring back the lost glory of the Valley’s hydraulic civilisation, while at the same time augment its modern urban water supply system. Nagahiti used to be often dry, and when water did flow it was contaminated. Then, 12 years ago the local group Alliance for Eco-tourism in collaboration with American Ambassador Fund for Cultural Preservation got to work to restore the system. “We started with first trying to document where the inlet and outlets were, map the canals and find ways to clean them,” explained Jharana Joshi of the Alliance for Eco-tourism. She said the main challenge was mapping the underground canals feeding the stone spout, many of which are located below residential buildings. Pipes were pushed into the spout up to 500m and dye released in the ponds to try to identify the sources of the water. The aquifer feeding the Nagahiti was thus traced to the Swangchiba pond on the town’s outskirts. After the source was detected, the actual restoration and cleaning of the canal began. Today, there is plentiful clean water flowing out of the spout, even in the dry season. While current demand for water in Kathmandu is 230 million litres per day, the water pipes laid down during the Rana period from Sundari Jal and Pharping supply only 50 million litres, and the system is so leaky that an estimated 75 million litres a day is lost.